What? You can’t make it for me? Updated for Mists of Pandaria, to 600 skill. Tailoring is a very useful profession to caster classes such as warlocks, priests, and mages. It can also craft bags which everyone needs and can be paired with enchanting for a very nice combination. Working your tailoring skills can also make you some gold, especially at high level. If you want to powerlevel the profession, you should have plenty of gold to start with. In addition to gear, you will be able to create hats and shirts and other clothes. Some of these sell for enough to make the effort quite worthwhile. Some want to wear something other than armor, on occasion, and some like to role-play. Take advantage of that. Enchanting can be a decent complimentary skill. You will be making lots of surplus items which you can then disenchant into the pieces necessary to level that skill. Obviously you will be able to enchant your own gear as you level and upgrade your gear. Profession perks: There are two perks, one of which is combat effective. You can embroider your cloak to provide an occasional large boost to a primary stat, such as Int. You can also create your own flying carpet. Lightweave Embroidery, self-only, sometimes procs 2k Int. Leg enchants that can add various stats and that others can use, as well as a self-only version that uses less int the way of materials. There are no longer an tailoring specializations. All the trainers have all the same recipes, except for some dungeon/raid drops. Mists of Pandaria Tailoring lifts the skill cap to 600 and your new title will be Zen Master Tailor. Lots of new tailoring recipes will become available for your use. Click here to skip down to the Mists of Pandaria tailoring section. Some of the recipes will require bind on pickup items such as Spirit of Harmony. These items must be farmed and gathered by you, as they cannot (yet) be traded/sold. As of early M of P launch, these can drop from just about anything, but are pretty rare. You can level to 600 without getting any of these items, but you will want them (quite a few of them) if you’re going to craft the epic gear (item level 474.) All the epic gear requires a 600 skill. Blood Spirits will be required for the 496 gear. These are found only by disenchanting raid weapons and can be placed in mining bags. Imperial Silk is the new “special” Tailoring material. It can be made once per day with 8 bolts of Windwool cloth, or anytime with 5 bolts and three Spirits of Harmony. One bolt of Windwool cloth requires 5 Windwool cloth to create. 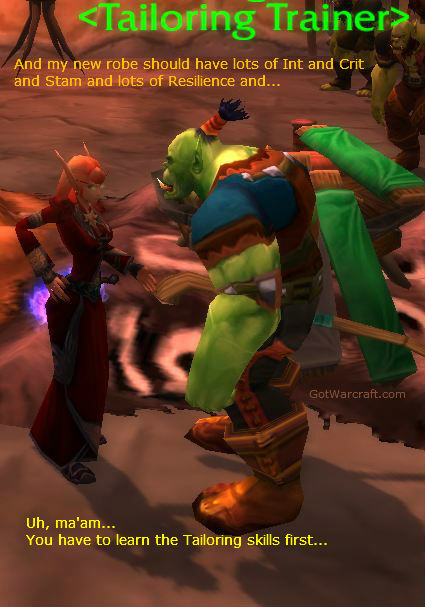 In Game Gold Guide: Gathering, Farming, Auction House, and Crafting. Click Here Now. it only takes two to reach 490 skill. Make sure you drop the extra pieces onto your Auction House alt for sale. You should be able to pick up extra gold by doing that. You can find the the Tailoring trainer in Pandaria here. Or portal back to your capital city. You can buy many of the new recipes from vendors in the Vale of Eternal Blossoms, Pandaria. The Contender’s gear recipes will cost 1 Spirit of Harmony each. You can get the spirits from world drops (very rare) or by doing daily quests when you hit 90. They are also available from the PvP vendor for 600 Conquest points each or you can farm them up with enough Tillers rep. In order to access this zone you will need to complete a quest chain. Once you have access to the vendors you will be able to grab the recipes (if you don’t actually have the tailoring skill you won’t be able to see the recipes.) You don’t need rep or to be level 90 to buy or make them. Here’s the starting point for the quest. Congratulations on your maxed out Tailoring skill! there are, you need to go to the Vale of Eternal Blossums amd go to the horde’s shrine of the two moons or Shrine of the seven stars for alliance and find the tailoring vendor within. from what I can find all they sell are PVP gear tho that will help you get to 600 then you need to get your faction higher and go to the quartermasters and get patterns there. Thanks. I did note the suppliers above. I’ll add in the start of the quest chain you need to do in order to access them. Every freaking web site including yours tells what you need to level, but don’t you think the FIRST THING you need is the TRAINER NAME and where they are at to TRAIN over 525? That’s a good point. I’ll update appropriately. Until then, you can always blip back to your capital city and get trained there. There should be a portal in that very first village in M of P. Set yoiur hearth in the village, portal over, train, portal back. Update: as of 9/29 there are no tailoring trainers in any of the Pandaran zones, none that I can find anyway.